Dentergems Wit is Belgium’s most authentic wit beer. Since 1896, Dentergems has been brewed to style with malted barley, wheat, coriander and citrus spices Dentergems is unfiltered to give it a cloudy appearance and uniquely refreshing flavor. Dentergems is brewed according to traditional White beer methods. The flavor is derived from barley malt, wheat and the subtle use of orange peel and coriander. 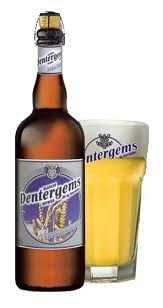 Dentergems is naturally cloudy which provides a complex set of flavors and the refreshing taste of citrus and wheat. Look for Dentergems Wit to be most refreshing with spicy foods like Mexican or Thai. The citrus spice compliments salads and blackened fish.